The new baby is designated J46, and we are going to call it "Star", for the role that it will play in showing the human inhabitants in this region that it is important to clean up Puget Sound and restore healthy abundant salmon populations to the Pacific Northwest. 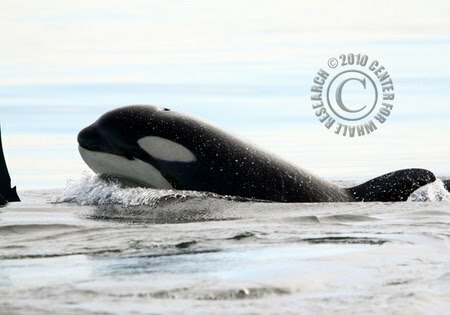 That mission brings a message to all of the relevant human nations – USA, Canada, First Nations, Treaty, and non-Treaty – that the first intelligent mammal residents of the region are also investing in these efforts. We could not ask for a more charismatic indicator, a baby whale, to measure the success of our renewed efforts for restoration. 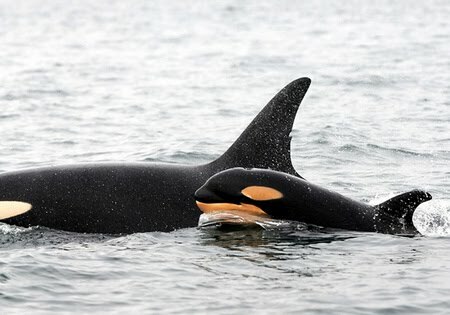 J pod is the most watched family of whales in the Pacific Northwest, or perhaps in the world; and, this is the first year in recent decades that they have produced three babies within one year. We will all be watching, here and worldwide, carefully and respectfully, to see if they beat the odds and all survive. This is the reality show that really means something. 'Star' at two months old. 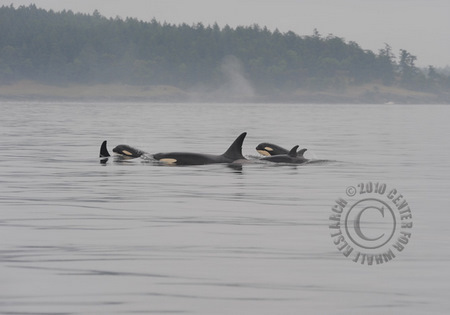 All of the J-pod calves born last year look healthy, and if you look carefully at the picture below you will see all three of the calves together with Star's mom and grandmother, the calves no doubt enjoying some play time together. So far, Star's future is shining brightly, as people continue to increase efforts to restore Chinook salmon populations and modify commercial fisheries. This little whale is indeed an icon of humanity's progress, and we'll keep an eye on this Star and report her progress as time goes on. Thank you for your extensive and educational post - undoubtedly a culmination of many years of research. Your photographs are incredible. Thank you for sharing your knowledge and photos via your blog!